The width of flange on a pipe should be sufficient to accommodate the nut of bolt. 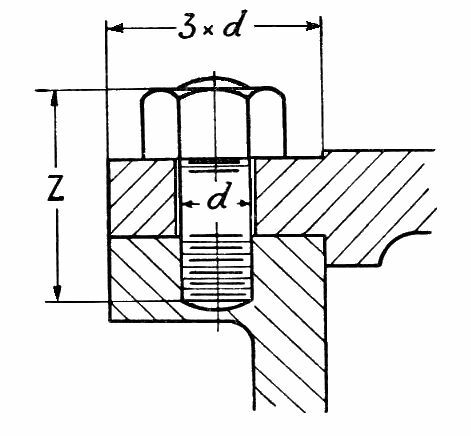 A nut across the corners is twice the bolt diameter, hence the minimum width of flange marked X on the example below will be 2 x diameter of bolt + 5mm. The bolt hole should be bored through the centre of flange land area. The bolt holes in pipe flanges are generally clearance holes, that is the hole is bored ½ mm to 2mm greater in diameter than the bolt (in proportion to the bolt diameter. The length of bolt y = depth of nut + 2 x flange thickness + 2 mm for join thickness. The thickness of a Flange depends greatly on the work it has to do. For example, in some parts of an installation or machine the flange is used to carry the whole weight of the structure. In others it merely serves as a coupling to connect one length of pipe to the next. Pipe flanges are usually made 5mm thicker than the body metal for cast iron items, and 2mm thicker than the body metal for brass work. Ribs are fitted when the weight of the part is suspended by the flange. In valve chests and housings, for securing the cover to the chest, studs are used in preference to bolts, as by using studs the breadth of flange can be made a minimum. It is usual to make the breadth of face of flange = 3 x diameter of stud, as shown on below. Stud hole in flange is bored to a maximum depth = diameter of stud + [ inch. In steam chests care should be taken that stud hole should not penetrate to inside of chest. 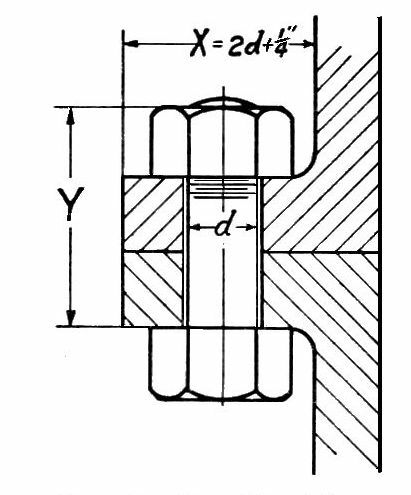 Length of stud (overall) Z = depth of Nut + flange thickness + diameter of stud, + 2mm for joint thickness.